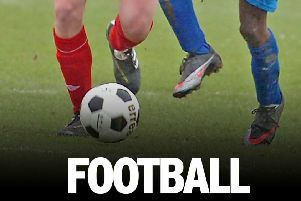 Brighouse Town missed a golden opportunity to improve their standing in the Evo-Stik NPL East section when held to a goalless home draw by lowly Wisbech Town yesterday. Boss Vill Powell thought his side were lacking in the final third and that a week off had caused his side to lose momentum after good results against Belper Town and Bradford Park Avenue. Keeper Daniel Swan was the visitors’ hero, making a couple of early saves from Zeph Thomas and managing to keep out a late effort from substitute Jack Normanton with his forehead. Tom Haigh was constructive in midfield for Town, in front of an attendance of 274, while James Hurtley, Kurt Harris and Adam Jones were solid in defence. Two of the three sides above Brighouse in the table were beaten, leaders Morpeth by 2-1 at Loughborough and Marske by 3-2 against next Saturday’s Hove Edge visitors Lincoln United in the battle of the second and third teams. Brighouse went above Marske but stay fourth because Tadcaster Albion, 3-0 home winners over Stamford, overtook the pair of them.